The World Affairs Council of Austin, in partnership with the Greater Austin Chamber of Commerce, is honored to present an exclusive briefing featuring H.E. Ivan Korčok, the Slovak Republic’s Ambassador to the United States of America. Please join us for this special conversation with H.E. Ivan Korčok and learn about the state of the Slovak economy and its success story in the 25 years of its independence. H.E. Ivan Korčok will be joined by Katarína Králiková, Economic Diplomat for the Slovak Republic. Ms. Králiková will highlight the the economic successes and gains made since independence in 1993. World Affairs Council of Austin members will receive invitation and RSVP details via email. 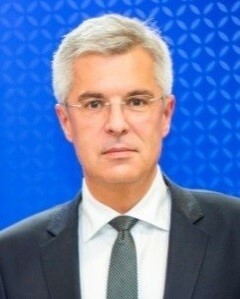 Ivan Korčok has been the Ambassador of the Slovak Republic in Washington since September 2018. Prior to this, he served as State Secretary of the Ministry of Foreign and European Affairs from August 2015. Between May and December 2016, he served as Government Plenipotentiary for the Slovak Presidency in the Council of the EU. Prior to these assignments, he was assigned the post of Permanent Representative of the Slovak Republic to the EU (2009-2015) and Slovak Ambassador to Germany (2005-2009). Ambassador Korčok began his career in 1992 at the Ministry of Foreign Affairs where he held many senior positions including Director of the Department for Policy Planning and Analysis (1997-1998), Director General of the Directorate General for International Organizations and Security Policy (2001-2002), and State Secretary (2002-2004). In 2003, he was Head of Delegation of the Slovak Republic on Accession Talks to NATO and Member of the European Convention in Brussels. Katarína Králiková is a diplomat with the Slovak Ministry of Foreign and European Affairs, currently serving as Economic Diplomat in New York. Previously she was Economic Counsellor at the Slovak Embassy in Pretoria, South Africa. Prior to joining foreign service, she worked in the European Parliament and Brussels’s based think-tank Wilfried Martens Centre for European Studies. Katarina studied international law and economics at universities in Slovakia, Austria and the UK.